I've been trying to brand out into more indies this year, and I've been so impressed with my finds. I don't know how all of you indie fans keep track of so many out there. There are just so many and so many are excellent. I wish I had endless money, that would make the whole indie things a lot easier. This next polish from Black Cat Lacquer is one I'm really liking! 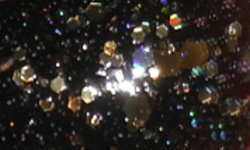 Nocturne is a black jelly filled with gold holo glitters with gold shimmer. Color: I love black and gold together. In fact, as you may know, I love gold with pretty much any color. I think gold is so underdone when it comes to glitters and shimmers. It's typically always colors paired with silver glitters or shimmer. I love the combination of color here especially with the gold holographic glitter. Formula: I have to be honest I wasn't expecting to be impressed here, but I was. Black jellies with glitters tend to have funky/messy formulas or the base drowns out the glitter. None of that here at all. This formula was perfect. The ratio of base to glitter was balanced perfectly, and I was able to apply this effortlessly. No digging for glitters or dabbing polish at all. Price: This is $9 on the Black Cat Lacquer website. Overall: I'm very impressed with Nocturne. It's an fabulous jelly glitter. I love the color combination and the formula blew me away. Awesome polish! A very nice dark jelly! I can see why you love this one Steph! Oh yes endless money to play with indies would be amazing! This one looks great! Way-Cool Mani Wednesday: All the Flakies!